Zimbra has published a new update for Zimbra Mail Server & Collaboration Suite, Zimbra 5.0.22 and Zimbra 6.0.5. This is the first update since VMWare acquired Zimbra. I would like to test it to see whether status & logger problem on Zimbra 6.0.4 has been officially solved or not. Add sysstat package using YAST | Software | Software Management or by usingÂ Zypper. Zimbra need another package such asÂ cron, fetchmail etc, but the installation process has installed all of them by default. Set your DNS soÂ A and MX records address will point toÂ Zimbra. I’ve published an article regarding DNS Server configuration to meet with Zimbra Requirement. apa pernah ngalaim hal spt diatas? dan bagaimana utk solusiny? My own zimbra 6.0.5 x64 on Opensuse 11.2 x64 How to!! Hi I followed this guide and everething is working exept that the “stats” service is not running, and in the last image there are x in the services, the stats page is asking for flashplayer too. Do you install it on SLES 11 or on openSUSE 11.1 ? Stats and service status on Zimbra 6.0.x+openSUSE need a modification to syslog as mentioned by Sappokus on his blog link. If you install it on SLES 11 as shown in my title, just wait for a few moment until it appeared correctly. Just click on refresh button on the service status. The stats page need a flashplayer and it is not Zimbra problem. Just install flashplayer plugin onto your browser and it should not complaining anymore. I used SLES 11 64 bit, and I have leave the server on for hours and the service doesn`t start, sometimes when restarting the server it start for a few minutes to later stop itself, I am testing this in a virtual vmware lan and the server sends and recieve the email, the only problem that I have found is this. By the way, is there a guide to install flash player in SLES 11 64bit, I have installed the rpm from the adobe site and it didn`t work. I have an issue with Zimbra Release 6.0.5 64 bit, after the installation, STATS is working perfectly but after 1month, it suddenly stop. I check everything and only stats is the one that stopped. Check the permission for folder /opt/zimbra/zmstat. It’s a bug on Zimbra 6.0.5 (and also on 6.0.6), sometimes the permission folder doesn’t correctly owned by Zimbra. Sorry, forgot to restart your Zimbra stat service. Wait for a few minutes or more after all service status refresh dan displayed correctly. Have you try NetRaid backup for Zimbra? I didnt try yet about Zimbra on DRBD but I want to know if you up this as the same setup from your Zimbra mail server. If you did, may i request to know the HOWTO. Thank you so much..
Hi Vavai, I’ve check my Zimbra regarding about the STATS and the zmstat is already owned by Zimbra. I verify the permissions and still the STATS is stopped after restart the service. Thank you. 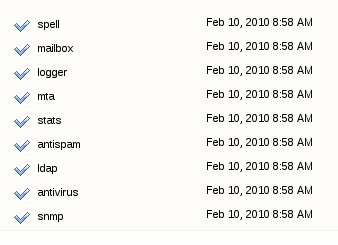 Hi Vavai, just want to ask if there’s a way that i can filter the spam mails under zimbra server web gui and filter the spam mails and not by user?